Over the summer of 2018, I interned at Queue Brand Communications, a creative agency that leads clients through digital adaptation, content marketing and marketing automation. 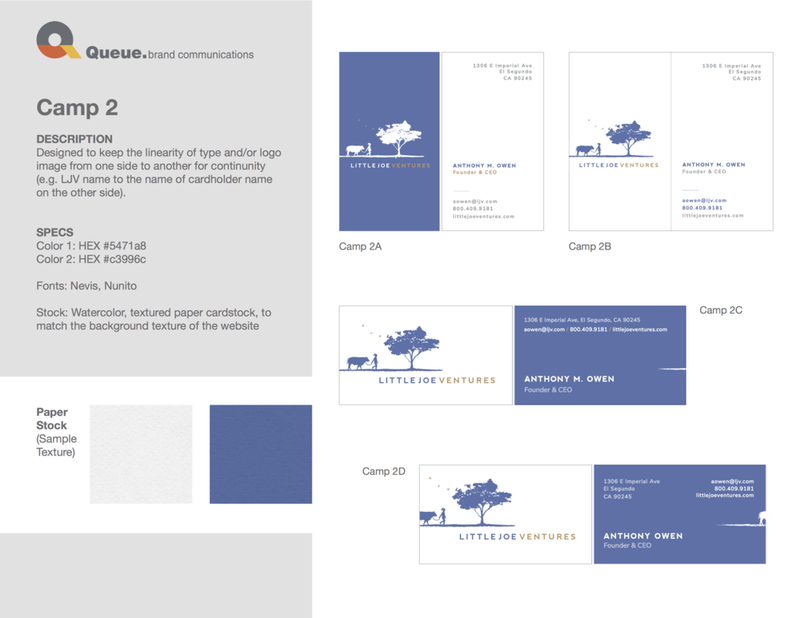 I created multiple camps to organize my proposals for business card designs for Little Joe Ventures, one of Queue’s Clients. Queue already had a new web redesign underway for the company, so the identity of these designs were inspired and based on the revamped website’s visuals, textures and typography. Working with the design team, I was able to narrow down my four camps into a few designs for them to present at their next meeting with LJV representatives (click on images below to scroll carousel). Four interns including myself were responsible for planning and organizing the summer event for the office. We managed to book a a space at an arcade bar and restaurant for the gathering. We needed a logo for the event and merchandise (t-shirts) to encourage office spirit. Working under a full-time designer and the CEO at Queue, we expanded and then narrowed down the options for designs for the outing logo. A file was sent and organized with a screenprinting company to get all shirts and sizes ready for the event.